Film noir is a well established genre that doesn't seem to be getting much of a break these past few decades. 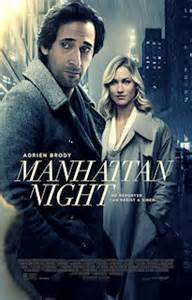 Nor does it get that break off Manhattan Night, a modern day film noir attempt about an endangered newspaper journalist (Adrien Brody) whose life destabilises when he stumbles upon a femme fatale. It is the latter than attracted me to this film in the form of Yvonne Strahovski, an actress I will always remember as Mass Effect's Miranda as well as Chuck's kickass agent Sarah Walker. Alas, both movie and Strahovski are hampered a rather poor plot.